This was the chance to make everything right. Instead, Texas Tech’s former coach – a title he likely prefers – declined IU’s olive branch last week, choosing to skip his own IU Intercollegiate Athletics Hall of Fame induction in fear of causing a media commotion and stealing the spotlight from this year’s other inductees. Some call it a victory lap, but Kyle Taber’s fifth year was anything but. Out of the loop? Here’s what IU coach Tom Crean had to say at Thursday’s press conference. In 140 characters or less, an IDS reporter Matt Dollinger tweets about IU coach Tom Crean’s new obsession. Freshman Malik Story will transfer from IU at semester's end, University officials announced Thursday night. The Hoosiers yelled for their teammates louder than ever in their final game of the season. The IU men's basketball team has had a long and trying season. The Hoosiers' 66-51 loss was one of the more eventful games of the year. These are the sights and sounds of the game. For the second straight season, an injury to IU’s leading scorer has come during one of the most crucial parts of the year. When he took over last April, Tom Crean knew “a very challenging situation” lay ahead. But no amount of preparation could have readied him for a season like this. Taber stood on Branch McCracken Court for the last time as an IU player. He grew up in Evansville worshipping the Hoosiers, committing to the school as a walk-on after its Final Four run in 2002. He wanted to win championships. Instead, he witnessed a different kind of history. Through five years and four head coaches, Kyle Taber still doesn’t have a lot to say. Senior Night speeches have been an IU tradition since 1973, when Bobby Knight ushered his senior class back onto the floor to deliver farewell speeches following the final home game. 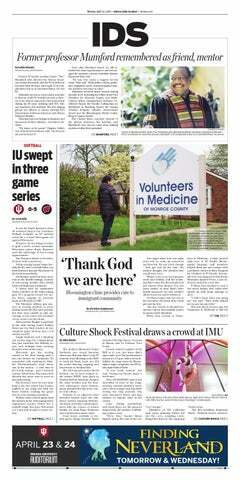 IU men’s basketball coach Tom Crean never set a timetable on how long it would take to rebuild the Hoosiers. The quest to return IU basketball to glory is proving to be a challenging one. IU’s compliance department discovered the secondary recruiting violation on Nov. 21 and self-reported the instance to the NCAA and Big Ten on Dec. 10. The coaching staff’s “mistake” was revealed during a routine check of compliance office’s phone call monitoring system. A year could be all that separates IU from experiencing the type of turnaround Northwestern is undergoing this season. WEST LAFAYETTE – Even with one side in full-scale rebuilding mode, the IU-Purdue rivalry wasn’t going to make any exceptions Saturday. On Saturday, the Hoosiers will forget about the Badgers and focus on the Boilermakers when they travel to West Lafayette to face No. 19 Purdue (20-6, 9-4). Since 2001, when Bo Ryan took over as Wisconsin's head coach, the Badgers have possessed one of the most recognizable styles of play in the country with their slow-it-down, slug-it-out defensive mentality. Passion for the past, predictions for the future?